It is men’s razor blade refills each have five precision blades spaced closer together Mach3 for less feel of irritation and comfort. Each blade refill also has a precision trimmer on the back, ideal for edging tough areas such as under the nose and sideburns. One razor blade refill equals up to one month of shaves. 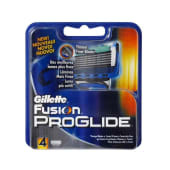 These fusion blade refills can be used with any fusion razor handle.